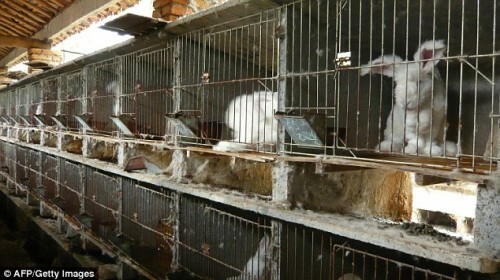 Rabbits are kept in dirty, cramped cages with little access to clean water. The rabbit is stretched as it is cut with an electric shear. 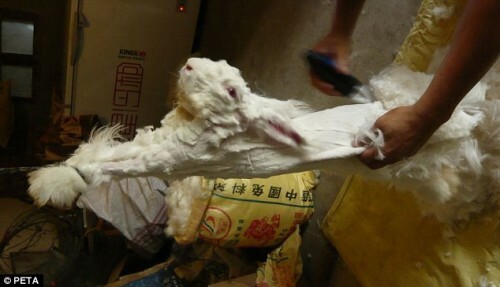 The rabbits are plucked while still alive and scream in agony during the process. The process is repeated on one rabbit over a few years until it’s throat is slit. This process in not unique to the angora rabbit. All fur products come from similar manufacturing roots. Wearing fur cannot and should not be likened to wearing leather or eating meat sourced from ethically farmed animals. The real issue here is that the animal is kept alive during the process and that the wearing of fur, unlike leather, does not serve a purpose other than vanity. No one is perfect and no one likes to be told their decision is wrong and immoral. 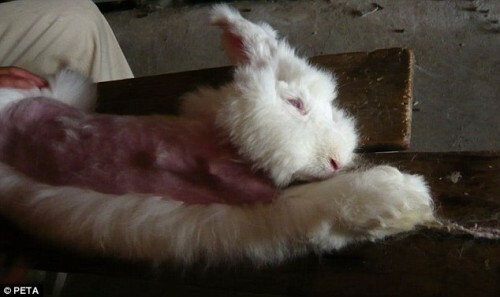 I am guilty of wearing clothes that have probably been produced in sweat shops, wearing leather and sticking to vegetarianism for 6 months at a time, but once images such as these cause even the highstreet fat cats to ban the product, can anyone really wear angora fur guilt free? Being obsessed with fashion has meant I have toyed with the idea of ditching the faux and wearing real fur. I’ve tried to justify it by telling myself it is okay because I eat meat and wear leather, but knowing and fully understanding the difference in fur production should be enough to stop anyone. In an age where the vast majority of the western world has access to central heating, double glazing and good quality faux fur garments, and where animal cruelty is a criminal offence, should any of us really be wearing fur at all?